The Federal Government has vowed not stop revealing the names of those who allegedly looted the nation’s resources, as more lists will be released soon. 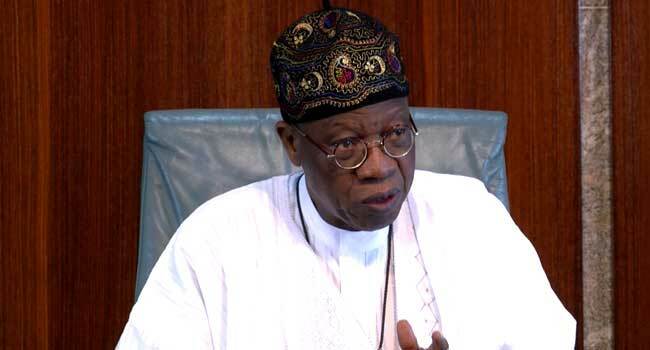 Minister of Information and Culture, Mr Lai Mohammed, said this on Sunday in Lagos in a statement by his special assistant, Segun Adeyemi. According to him, the pressure being mounted on the government over its decision to expose alleged looters is not unexpected. ”We know where the pressure is coming from. However, the die is cast. We will not stop until we have released the names of all those who have looted our commonwealth. Those who have not looted our treasury have nothing to be afraid of,” the minister said. He further assured Nigerians that no amount of pressure, including the antics of hack writers and threats of litigation, would prevent the government from releasing more names of the alleged looters of the public treasury. Mohammed alleged that since the release of the first two lists of alleged looters, there have been overt and covert attempts to intimidate and blackmail the Federal Government into discontinuing the release of more names. The minister pointed out that the government does not have the power to try or convict anyone accused of corruption, saying it was the exclusive preserve of the courts. He, however, maintained that the government has the power to let Nigerians know those who turned the public treasury into “their personal piggy banks on the basis of very concrete evidence, and that is what we are doing”. Mohammed acknowledged that the government has always known that corruption would fight back, adding that it was not surprised at the purported hiring of hack writers to attack the very idea of naming and shaming alleged looters. He decried that the worry about politicising the anti-corruption fight was aimed at preventing the government from releasing more alleged looters’ names. “But 1,000 negative write-ups or editorials will not deter us from releasing the third and subsequent lists. For those who have chosen to give succour to looters, we wish them the best of luck with their new pastime,” the minister said. He further challenged anyone who feels that he or she has been wrongly accused to seek redress in court. Mr Mohammed reiterated that it was the Peoples Democratic Party (PDP) that challenge the Federal Government into releasing the list of alleged looters. To this end, he insisted that the argument that the list only contained the names of PDP members fell short without proper contextualisation. While the government does not underestimate the worry of alleged looters, the minister assured Nigerians who are justifiably outraged at the plundering of the nation’s wealth of the government’s determination not to back down in the anti-graft war. He maintained that Nigerians deserve to know those who have wrecked the country and mortgaged the future of their children.